Hallmarking handmade jewellery is a topic of heated discussion among the silversmithing community. Although it seems like a daunting task for many jewellers out there, once you know the facts you'll be ready to go! London Assay Office makes the process really easy for you, providing all the information you need online - including videos which are embedded throughout this post to help guide you. At Kernowcraft, we are often asked questions about hallmarking, so we contacted London Assay Office to find the answers to your most frequently asked questions, specifically for jewellers. All of the answers below are written by the lovely team at London Assay Office, if you have any questions regarding the points raised please contact them here. 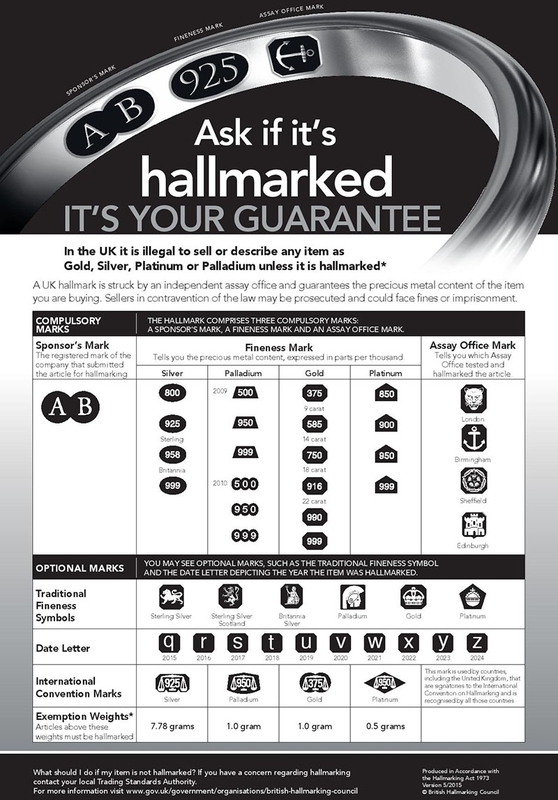 What is hallmarking and is it a legal requirement? Precious metals are rarely used in their purest form but are usually alloyed with other metals for workability, durability, wearability. It isn't possible to detect an article's precious metal content by sight or touch. Therefore, it is a legal requirement for an Assay Office to hallmark articles containing precious metals if they are described as such. Hallmarks are marks applied to precious metals to indicate the amount of pure metal in the alloy. Traditionally applied by striking with a punch, hallmarks can now also be applied using lasers. Platinum, gold, palladium and silver- weight exemptions apply to each. It’s a legal requirement for silver over 7.78g, gold and palladium over 1g, and platinum over 0.5g to have a UK recognised hallmark. I need a hallmark but I don’t know where to start, what are the steps to get started? To sell precious metal articles legally in the UK, you need to have them hallmarked. We know this can seem a daunting prospect, so our aim is to provide a simple, practical guidelines which simplify the hallmarking process from registration, submitting your work and payment options, to receiving your work back with a beautifully-crafted London hallmark. 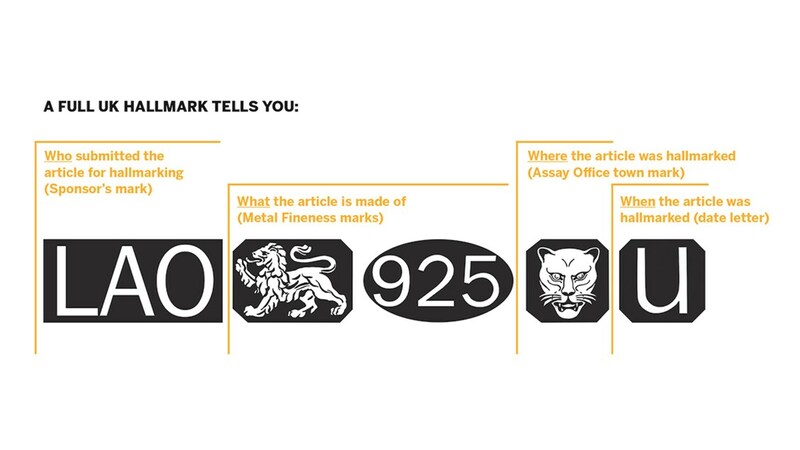 To start hallmarking, first you need to register with an Assay Office. On registering with us, you select your sponsor's mark, then, either order your punch, or choose to have your work hallmarked by laser. If you are a full, or part time student, you can take advantage of our exclusive student registration package. How do I choose which Assay Office to go with? The Goldsmiths Company Assay Office is the home of hallmarking – the word “hallmark” in fact comes from when people would bring their goods to our Hall to be marked. We are where hallmarking began in the UK, and we have been testing and hallmarking precious metals for over 700 years. The leopard’s head mark of London has been used by some of the finest craftsman in history and continues to be the mark of quality for many of the leading jewellers and silversmiths today. 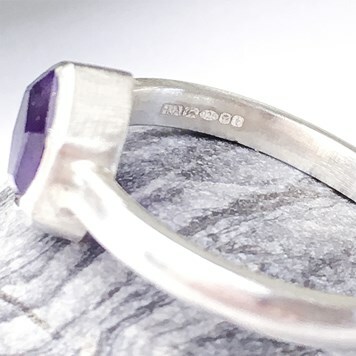 In order to retain this quality, we regularly employ apprentices who receive four years of specialist training before becoming skilled in the art of assaying and hallmarking. The combined experience of our team is the keystone of our expertise and professionalism. We use the most modern and advanced equipment and technology that is available, not only to apply our laser hallmarks but to manufacture the finest quality punches used for traditional marking. Helping the customer lies at the heart of everything that we do and we have always tried to respond to the changing needs of the trade. Today, we are conscious that quality, speed and flexibility of services are a high priority. As well as operating over four sites, we also offer four different levels of service to help you achieve your lead times. Our digital portfolio includes online registration, packet tracking, packet payment and email and text alerts letting you know when your work is ready. We also keep you updated with all the news and events through our e-newsletter and social media sites, and can provide point of sale material to help you market your product. Being part of the Goldsmiths’ Company means we are dedicated to supporting the trade, students, graduates, and the public by providing educational lectures and tours, workshops and training. You will also often hear about us going on the road to schools and colleges to talk about the importance of hallmarking. We realise that some people may find hallmarking a little daunting at first, so we offer a complimentary behind the scenes tour for every new customer to give you a better understanding. Furthermore, we offer a range of other services, all designed to help the trade in different ways - and each delivered with quality. We offer Valuations, Laser Engraving, Laboratory Services, Photography Services, Antique Plate Committee, Assistance to Trading Standards, Punch Making, assistance with Tracing Hallmarks, Lectures and Tours. Read more about our support for the trade here. What is a Sponsor/Makers mark and is it a requirement? (NB: Sponsor’s Mark is also known as Maker's Mark.) This is the registered mark of the company or person that submitted the article for hallmarking. It is formed of initials of that person or company inside a shield shape. The shield shape varies, and a minimum of two initials must be included. Every one is unique. When you register with us, you are registering a sponsor’s mark - the first symbol in the hallmark. Each sponsors’ mark is unique and therefore provides a traceable link to the source of an article. A sponsors’ mark comprises of the initials of the person or company registering (minimum of two, maximum of five initials) within a surrounding shield. Will the Assay Office design the mark for me or do I need to supply a design? We offer 45 standard shield designs to choose from. Bespoke designs are available by special arrangement at an additional cost. How long does registration last for and what is the cost? A ten year registration fee costs £72 (including VAT) and is renewable after 10 years. This fee includes free laser set up for standard designs. Should you wish to purchase a punch so you can have your hallmark applied by hand this costs an additional £85-90 per punch (depending on quantity of initials requested). You can register online here and will be guided through the choices. Find out more here. I’m a student - can I get a discount? All full and part time students on a current jewellery or silversmithing course can register online free of charge for a 10 year laser only registration. Find out more here. What if I use two metals in one piece of jewellery? Would recommend watching the video on this – but the below text is from our Hallmarking Guidance Notes download. fineness for that metal i.e. silver 800, palladium 500, gold 375, platinum 850 (parts per thousand). silver, palladium, gold and platinum. This will normally be struck on the appropriate metal. The minor (fineness) mark will be stamped on the “higher” precious metals. How do I choose between having a punch hallmark or a laser hallmark? Traditional struck marks are made with a punch, creating an impression by moving (forming) the metal - this can leave a slight 'bruise' on the metal, or can distort it (depending on the thickness). This can be removed by an experienced jeweller or silversmith by filing and finishing, a process known as 'setting back'. If your work is unfinished, a struck mark is recommended as the result is deep, and can then withstand plating and general finishing. This hallmark will last a lifetime. Handmarking is the most traditional method of hallmarking, and is carried out using a punch and hammer. This type of marking is not recommended for very thin metal, delicate or hollow articles. Pressmarking is another traditional form of hallmarking. Essentially it is an automated version of handmarking with marks applied using fly press or air press. The process is often used for large runs of the same or similar type of article. If your work is finished and polished, a laser hallmark is ideal as the process does not displace the metal so you won't need to set it back. Laser Marks are made with either a fibre, lamp pump, or diode laser - all three are used across our offices. A very fine, high powered beam vapourises the surface of the metal and etches on the hallmarks. Laser marking is the most recent method of applying the hallmark. The limited depth of focus on a laser makes flat articles, such as watch backs, photo frames, tops of cufflinks, and flat areas on large wares the best suited to laser hallmarking. Marking on curved articles is possible when the radius of curvature is sufficiently shallow to maintain focus (a smaller size/length mark often helps for those articles). If you order a punch its size should reflect the type of articles to be hallmarked, and choosing the correct size is paramount. A large punch will be unsuitable for delicate items as the punching process will displace the metal. On registering with us, you select your sponsor's mark, then, either order your punch, or choose to have your work hallmarked by laser. When you register with us the fee includes free laser set up for standard designs - so you can switch between methods. Can I get gold vermeil (gold plating over sterling silver) hallmarked, if so will it be hallmarked as sterling silver? Yes – Gold plated silver articles will be hallmarked as silver. Please note that we have to be able to test the allow underneath the plating. Gold plated base metals items cannot be hallmarked, this includes ‘bonded gold’ on base metal, ‘rolled gold’ on base metal and ‘plated gold’ on base metal. If I have a gold pendant with a tiny silver detail on it, will it be hallmarked as gold? No, silver with a gold part mark. I have noticed a lot of jewellers hallmark their silver jewellery despite being under the 7.78g - why would this be? I have a silver ring which weighs under 7.78g but with a stone set it is over - should I have it hallmarked? Complete weight of metal, including base metal which is relevant. Stones or leather etc don’t contribute. Do I need to use a 925 punch on sterling silver items if under the required weight? What is a Dealer’s notice? The Dealers' Notice can be downloaded here. Do I need to display a Dealer’s notice at a craft fair? I also sell jewellery on my website and Etsy, do I need to display a Dealer’s Notice? When selling my jewellery in shop or gallery, do I need the retailer to display the Dealer’s notice? The shop or gallery should have it on display – one to cover the shop. Dealer’s notice is for the dealer! Is it better to send unfinished or finished jewellery to be hallmarked? This depends on which method of marking you request. Either way, the work must be clean and free from dust. You should consider that the metal will displace when a hallmark is struck by hand. So, there may be bruising on the other side of the struck mark - your piece will need setting back to finish it up. Conversely, if you are sending items for laser marking, they should be sent in their finished stage as they can't withstand a heavy polishing. Is it better to send off a large quantity of articles for hallmarking at one time? No difference - price brackets vary on quantities sent in (and time). What is the average turnaround time for a piece of jewellery to be hallmarked? Standard turnaround for our hallmarking service is typically 5 working days - however work may take longer in times of high demand. You can have your work marked quicker by using a Priority Service - One Hour, Same Day, Next Day (aka. Early Hall), or Guaranteed 5 Day (online only). When submitting your items for any priority service, please write the type of service on the front of the outer packaging so we can process accordingly from receipt. Read more about speed of service here. Can I send strips of silver cut to an average ring length to be hallmarked before I make them to size for customers? Or does the item have to be properly formed into a ring first? This is more cost effective for me to send in lots of articles in one go rather than as and when I get an order. You can send strip form – providing no metal is added to them afterwards. How can I tell whether my jewellery is one or more articles? For example, does a pair of earrings count as one or two articles. Earrings and cufflinks are marked as INDIVIDUAL articles. Therefore 1 pair is 2 articles. A pendant and chain where the pendant is fixed to the chain (either soldered or not able to be removed from either end of the chain) is only allowed one hallmark as it is deemed to be one article. A pendant and chain where the pendant can easily be removed from the chain can have a hallmark on the pendant and the chain as they are deemed as 2 separate articles. I need to send in an engagement ring, how do you ensure that the polish and the stone won’t be damaged during the hallmarking process? Refer to T&Cs for specifics. We don’t take responsibility for stones…but we deal with tens of thousands a year. Do I have to send in findings which I’m going to attach to my jewellery with my packet? Yes! All related precious metal elements as sold onto the consumer must be sent to us for testing. All articles sent in should be clean and free from liquids and dust etc. This is especially relevant for second hand articles. Can I specify where I’d like the hallmark to be on my jewellery, if so how? Unless specified, hallmarked are placed in default positions depending on the type of article. While the hallmark is regarded as the oldest form of consumer protection, it can also be used creatively as a marketing tool. Not only does it provide provenance, but it can also be used as a mechanism to commemorate special occasions or events; yet many people still don’t understand its significance. Many of our customers appear to submit their articles for hallmarking without considering the many options available to them for its application. To some, the hallmark is just a legal stamp and its application purely a duty, but it does not have to be so. The hallmark is a thing of beauty – intricate and detailed, expertly applied – and it can truly enhance the appearance and add value to a piece. The standard hallmark formation is a horizontal mark with minimal spacing between each hallmarking component. Many customers – particularly those submitting jewellery – leave the placement to our discretion. When it comes to silverware, it is more common for the desired position of the hallmark to be indicated on the piece, and many silversmiths request display marks. A larger mark is quite standard on larger pieces, but the hallmark is increasingly being used as a design motif, an accent or a focal point, and the display or “feature” mark is the perfect way to achieve this effect. Read more here. (And video on Hallmarking Positions most relevant). In fact, it is possible to specify the size, location and configuration of the hallmark components of any article. It’s the perfect opportunity to make the mark more personal and to create something that is in harmony with a piece by incorporating it into the design. The hallmark is a unique signature and stamp of authenticity. Its power is in the guarantee of fineness – it provides a talking point and gives customers confidence in the work. So, as long as it can be applied in the chosen location and it complies with the law, it is a fantastic way to add value to a business. If you wish please indicate your preferred position using the hallnote special request section. You can indicate on the item itself with a marker pen where you would like the hallmark applied. We can advise on the most suitable positioning for any hallmark. If I repurpose a silver item such a spoon into a piece of jewellery, do I need to send it off for a new hallmark? Yes. Repurposing work is called “Change of Use”. If I send you an unfinished piece of jewellery and have it laser hallmarked, is there a risk of the hallmark wearing off when polishing? If I’ve sold jewellery to a customer abroad, do I need it hallmarked? If the customer purchased the item in the UK it needs a hallmark. What happens if I don’t get my jewellery hallmarked? What’s the best way to get in contact with Assay Office if I have another question?